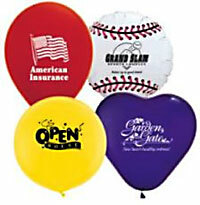 We make it simple to place your logo on balloons. As part of our commitment to your satisfaction, we offer friendly assistance with all types of balloon printing. We can take your camera-ready art and apply it to your choice of latex balloons or foil balloons, or we can assist you in developing an imprint solution just for you. 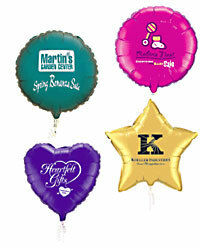 We can provide your message printed on balloons. Contact Laurayne at the phone numbers or email address listed below for help with all of your Custom Imprinting needs. The minimum order is 100 for latex balloons and 50 for microfoil balloons. Lead time 10 to 14 working days. Express is available for an additional charge.